Harmony Montessori depends upon the generosity of its supporters to bridge the gap between tuition and operating expenses. Our board strives to keep tuition at a level that is affordable for most families in SE Portland. We are also committed to providing need-based financial aid to families who might not otherwise be able to afford a Montessori education for their child(ren). Harmony Montessori is a 501c(3) non-profit and all donations are tax-deductible to the extent allowed by law. Do you know a good strategic partner or community leader who would be interested in helping Harmony reach its financial goals? We’d like to invite them to Harmony for an Open House at the beginning of November! We’re hosting friends and interested parties for wine and cheese to dig into the things that really matter when it comes to educating our youth. These are things that we hold as core values at Harmony: providing anti-biased education rooted in equality and accessibility for all people, teaching children to care for and sustainably use our outdoor environment, and creating change through partnerships with our staff, families, and the city of Portland. If you know someone who should receive an invitation, please email Mike Street, Fundraising Chair at hms.fundraising@harmony-montessori.com. 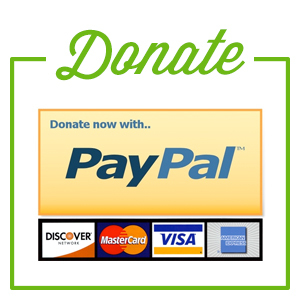 On-line Donation: You can donate securely through paypal by clicking on the “Donate” button to the right. Annual Auction: Our Annual Auction raises funds for our financial aid and Children’s Fund program. This fun-filled event is anticipated each spring and there are numerous ways to participate from donating goods and services to volunteering time to help with the numerous jobs that go into making this a successful event. We encourage everyone to attend and show their support of Harmony Montessori. If you can’t attend please consider making an on-line donation. To learn more about this years auction head over to our Auction page. Amazon.com: When you visit Amazon.com through the link on our website, Amazon donates 0.5% of your purchase price back to Harmony Montessori School. 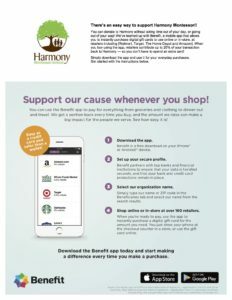 Scrip: Harmony participates in the Benefit app, which is a digital gift card platform. Download the Benefit app on your iPhone or Android, create an account, click on beneficiaries under “Schools” and search for Harmony Montessori School. Verify your account for purchasing and start shopping! Each time you purchase a gift card it will let you know how much you earned for Harmony. Fred Meyer Community Rewards: Sign up for this program by linking your Fred Meyer Rewards Card to Harmony Montessori School by clicking here. You can search for us using our name or by our organization number HL579. 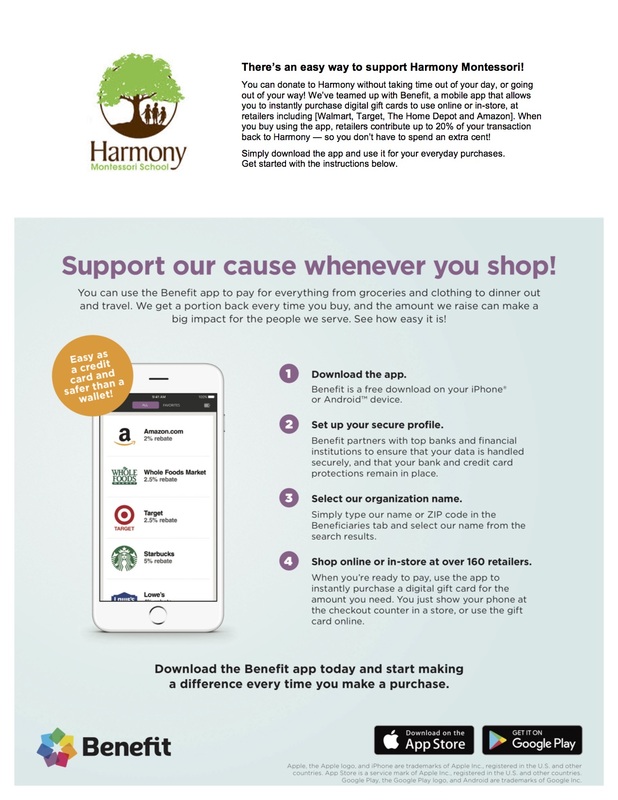 Then, every time you shop and use your Rewards Card, you are helping Harmony earn a donation! Primary: Earn money anytime for our school when you buy essential kids clothes! Shop Primary with our school’s unique link: www.primary.com/school/harmony and 10%-15% of that sale goes directly back to our school. Plus new customers get 20% off first order with code: HARMONY. This is an ongoing fundraiser and anytime you shop with Harmony’s unique link we will receive a percentage of the sale. Tuft & Needle Mattresses: Want to buy a new mattress and support Harmony at the same time?Visit tn.com/givesback and choose Harmony Montessori from the pulldown menu. Then continue to the website and choose a mattress for as low as $350 for a twin (a king is only $750!). When you purchase your mattress, Harmony will receive 25% of the purchase price AND a free mattress (one per year) for our auction! So if you’re thinking of buying a new mattress, get yours from Tuft and Needle through the link above.